This is an outfit from April 6th. 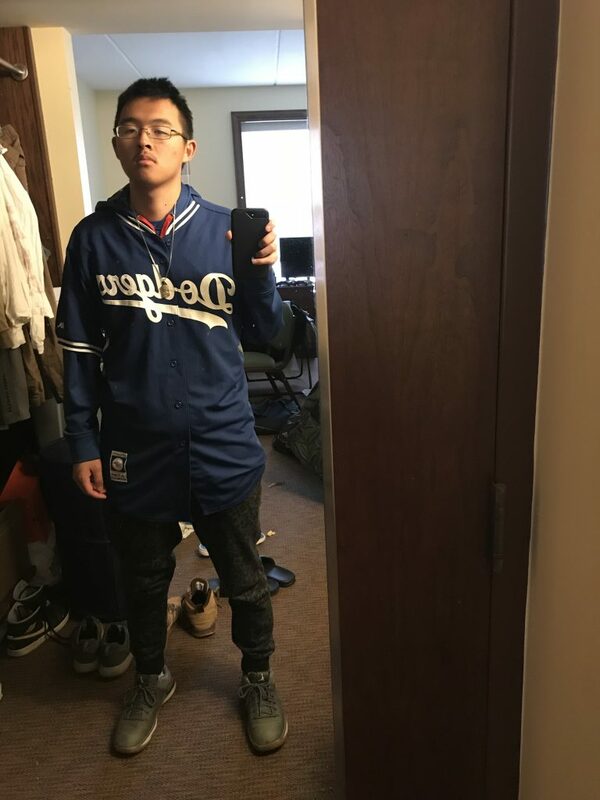 The outfit consists of an alternate practice jersey of the Los Angeles Dodgers from Majestic, and underneath a blue Los Angeles Clippers hoodie pullover. For the bottoms, I chose to wear a pair of Nike sportswear joggers in a camo colorway. And for my shoes, I picked a pair of Air Jordan 31 Lows in a camo colorway as well. I also have included in the image as part of the outfit my Jesus piece pendant chain. Let’s start with the top. I chose to wear a hooded sweatshirt pullover underneath the jersey because of Ohio’s crazy weather. When I was getting my outfit ready, I checked the temperature and saw it was in the mid 30’s to upper 40’s degrees Fahrenheit. I was planning on wearing a jersey anyways, but had to alter to outfit due to the weather. The Dodgers jersey I am donning in one of three Dodger jerseys that I own. Being from Los Angeles, I am a big fan of the Dodgers and look to rep them wherever I go, especially being in a place that supports the Indians. With the pants, they are part of the Nike Sportswear collection. The color scheme of the pants is a nice olive green, which is a fairly easy color to match with dark colors such as navy blue and black. The pants also have a couple side pockets that come in handy to stash things such as phones, wallets, or earbuds. I try to have my shoes coordinate with the rest of my outfit. In this case, the shoes coordinate with the pants. Since I had gotten the pants before the shoes, I knew when I saw the shoes that I needed to get them in order to match my outfit. The camo print on the shoes matches with the print on the pants. Along with the print, the gum bottoms of the shoes contrast well with camo colored print. I also got them since I am a big fan of Nike and Jordan apparel and shoes. Finally, with this outfit, my Jesus piece is pictured. It represents my faith and my belif in myself. I have owned and worn it for almost three years consecutively. The aesthetic that it gives off is one of fancy yet sophisticated in the representation of a higher power. go dodgers. You always bring the freshness with the joggers and the kicks. You probably could’ve worn any shirt with this fit, but you sent the jersey, and I respect that.